Lin-Manuel Miranda Is Taking 'Hamilton' To Puerto Rico : The Two-Way The show's creator hopes that the three-week run, scheduled for January 2019, will help boost economic opportunities and cultural tourism to the island. Lin-Manuel Miranda (center) performs in Hamilton in July 2016 in New York City. Welcome back to the Caribbean, Alexander Hamilton: This morning, Lin-Manuel Miranda, the composer and lyricist of the Tony- and Pulitzer Prize-winning smash Hamilton: An American Musical, announced that he is taking the show to the University of Puerto Rico's campus in San Juan for a limited three-week run in January 2019. 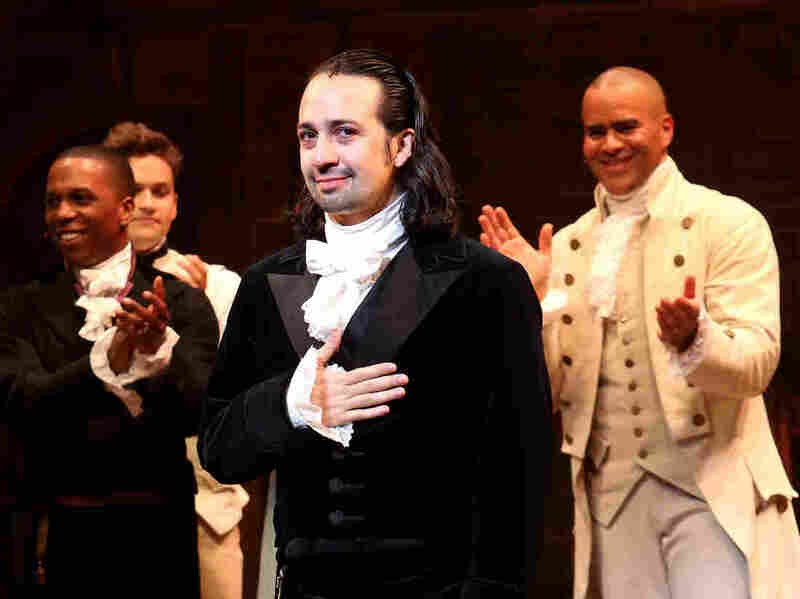 In Puerto Rico, Miranda himself will star as Alexander Hamilton — the first time he has reprised the role since he ended his Broadway run in July 2016. Other casting will be announced at a later date. In a press release early Wednesday, Miranda, who is of Puerto Rican heritage, said he had been hoping to bring his smash hit musical to the island ever since Hamilton first opened off-Broadway at New York's Public Theater two years ago. "When I last visited the island, a few weeks before Hurricane Maria," Miranda said, "I had made a commitment to not only bring the show to Puerto Rico, but also return again to the title role. In the aftermath of Maria, we decided to expedite the announcement of the project to send a bold message that Puerto Rico will recover and be back in business, stronger than ever." Miranda and the show's producer, Jeffrey Seller, say they hope Hamilton's run in Puerto Rico from Jan. 8 to 27, 2019, will help stimulate the U.S. territory's economy and cultural tourism. As with the Broadway and touring runs of the show, however, the Hamilton team will also hold a lottery for $10 seats. The university's theater, Teatro UPR, suffered damage to its roof and ventilation systems during Hurricane Maria and is set to undergo repairs before the show opens. Last month, Miranda released a single, "Almost Like Praying." The track, with its reference to Leonard Bernstein's musical West Side Story (and whose heroine is a recently arrived Puerto Rican immigrant to New York), features a who's who of current Puerto Rican and other Latin artists alongside Miranda, including Luis Fonsi, Ruben Blades, Marc Anthony, Gloria Estefan, Jennifer Lopez and Rita Moreno. Proceeds from the song's release have gone to Hurricane Maria relief efforts in Puerto Rico, via the Hispanic Federation's Unidos disaster relief fund.